The Landau-Lifshitz equation (LLE) governing the flow of magnetic spin in a ferromagnetic material is a PDE with a noncanonical Hamiltonian structure. 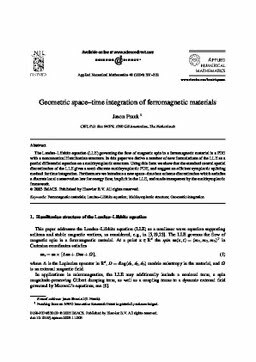 In this paper we derive a number of new formulations of the LLE as a partial differential equation on a multisymplectic structure. Using this form we show that the standard central spatial discretization of the LLE gives a semi-discrete multisymplectic PDE, and suggest an efficient symplectic splitting method for time integration. Furthermore we introduce a new space-time box scheme discretization which satisfies a discrete local conservation law for energy flow, implicit in the LLE, and made transparent by the multisymplectic framework.